The No. 4 ranked player in the world Caruana became a Grandmaster at the age of 14 years, 11 months, 20 days. He was the youngest grandmaster in the history of the United States until this record was beaten in 2009 by Ray Robson. In October 2014 he achieved an Elo rating of 2844 becoming the third highest rated player in history. 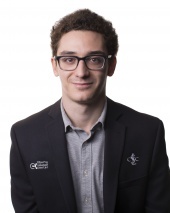 During the 2014 Sinquefield Cup, Caruana won with an unprecedented 7 game winning streak that set a world record for the highest performance rating in chess history. Caruana played as board 1 when the U.S.A. won the chess olympiad for the first time in 40 years in 2016.